Gas pump con artists are upping their game. 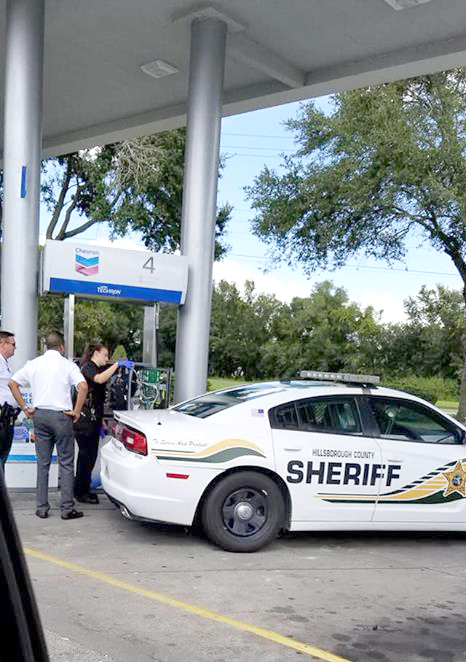 High-tech skimmers were placed on Riverview gas pumps with innovations deputies have never seen before. “The skimmer located is higher tech than what we have seen in the past, with Bluetooth capabilities, which allows for remote download of credit card information,” said Cristal Nuñez, a spokesperson for the Hillsborough County Sheriff’s Office in a statement to The Observer News. Police have seen an increase in the use of skimmers in general lately, Nuñez said. Deputies found skimmers at a Chevron Oct. 7 after they were alerted by attendants at the gas station, 13202 Summerfield Blvd., near Big Bend Road. The station is owned by Big Bend Gas Inc. and is open seven days a week from 6 a.m. to midnight, except for Sundays when it opens at 8 a.m.
“We have found the issue to be at stations that close at night and then reopen in the morning. Those stations are dark at night, and that’s when (the skimmers) are usually installed,” Nuñez said. While gas stations that close overnight are a softer touch for thieves, 24-hour stores haven’t deterred the con men. Skimmers were also recently found at the Shell station at 6912 Big Bend Road, Gibsonton, and the 7-11 at 3603 S. Falkenburg Road, Riverview. Both stations are open 24 hours a day, seven days a week. Up to now, thieves had to physically retrieve the skimmers, which can be installed in less than a minute, from gas pumps. The Bluetooth technology means once a skimmer is secretly installed on a gas pump, credit and debit card information can be downloaded remotely using a cell phone or laptop. Inspectors found 169 skimming devices in 2015 in Florida. That number jumped to 655 in 2017, according to the Florida Department of Agriculture and Consumer Services. In the first six months of 2018, state inspectors have uncovered 539 skimmers. Chevron has upgraded its cameras since the incident, according to a store manager. Wili Sargable arrived at the station just as a forensic team from the Hillsborough County Sheriff’s Office was removing the device Sunday, Oct. 7, at 1 p.m.
“I have heard of the skimmers more than I have actually seen one, and don’t know if I would recognize one if I saw it other than some sort of piece of electronics that is able to read and record information off your credit card,” said Sargable, who has lived in Riverview since the early 1990s. While it was the first time Sargable had seen a skimmer in person, he is more than familiar with the havoc they can create in personal finances. Con men emptied his bank account to the tune of more than $2,000 in May, charging $75 in cash 25 times at gas stations in California. • If using a debit card at the pump, choose to run it as a credit card instead of putting a PIN number in. That way, the PIN number is safe. • Monitor bank accounts regularly to spot any unauthorized charges. • Consumers who suspect that a gas pump has been tampered with should contact the gas station manager, local law enforcement, or the department’s consumer protection and information hotline at 1-800-HELP-FLA (435-7352) or, for Spanish speakers, 1-800-FL-AYUDA (352-9832).